But downtown: Beauty. Community. things expressed in chalk and blog-love much better than my mere words can articulate. Izenmania got some great pictures as well as Elle, and RR Anderson and Kevin. He is veteran freelance illustrator with ties to Cartoonists Northwest and the Graphic Artists Guild. Check him out here. I can't wait to talk to him some more. I bet he has some stories to tell. Yet, Stowe's combined effort with Tacomamama would eventually win the day. All that being said... a vote for me is a vote to send someone that is an unparalleled local parental resource on a nice one night vacation. I came to her, explained what I was going to do and made sure she would be done with it. 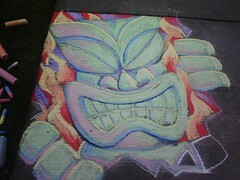 Thus, Stowe and Andrea are now both tied in the Frost Park Chalk Off Challenges with two wins a piece. Was Episode VI "fair"? Does open source voting open the system to unfair manipulation? 4) True to the original goal to "Take Back Frost Park"
Perhaps the harder question is: are votes by bloggers logging on and often getting their friends to vote simply creating a popularity contest? Can the "commoners" identify the best art? Are the best art pieces winning? Overall, I would put the Tacoma citizen juried blogger system against any "professional" juried art group. Art experts have their own set of biases. I remember when some of them didn't want the Museum of Glass to really carry much glass much to the dismay of visitors who walked away dismayed. The organic nature of Frost Park Chalk Off system would not have allowed that to happen. Plus, the dynamics of Frost Park Chalk Offs tend to be self correcting. by izenmania on 5/17/2008 @ 12:40am I think we've seen a couple examples of it correcting itself... artists or friends who started in on loyalty or self-voting, and once they had gotten that out of the way for a week or two started voting on pure merit. by Erik on 5/17/2008 @ 1:05am I think we've seen a couple examples of it correcting itself... artists or friends who started in on loyalty or self-voting, and once they had gotten that out of the way for a week or two started voting on pure merit. Yes, one could perform an analysis of voting patterns. There are some people who only post on Feed Tacoma to vote in a Chalk Off for their person. But they have been relatively rare in the past. Most voting is pretty fluid. So the votes seem pretty fluid. The Blogosphere has some sort of artistic and ethical standards, but knowing what it is at any particular moment is another issue. This whole thing is hella cool. Hats off to R.R., Erik and anyone else who was involved in ratcheting this thing up to critical mass, which appears to have been reached. Mainstream media attention has to be in the offing soon. Could invading artists from that big city to the north be far behind? Second, the warm season is still very young and with reliable weather approaching, the number of artists increasing, multiple wins accruing to certain artists and the quality of the prizes on the upswing... perhaps it is time to brew up some sort of playoff system. Imagine the tension and drama that could be created with an overall championship at stake. by NineInchNachos on 5/17/2008 @ 7:54am zowie, what a turnover! we had some KILLER submissions. The real winner in all of this are the folks on the street who get their minds blown with art whilst on their way from here to there. the people of tacoma who turn and ask "what is happening?" "Is this a class?" "what is this all about?" by jenyum on 5/17/2008 @ 8:14am Taking out some of the names I recognize amongst my husband's friends and just counting him and the other votes, I still get 12 for Stowe. So it's all good. Glad to see Jason was finally motivated to register here. I think FeedTacoma gained 8 or 9 airsoft enthusiasts last night. What are the chalk art possibilities of this development? A 72 hour film festival consisting mostly of war movies? Only time will tell. by Erik on 5/17/2008 @ 10:50am This whole thing is hella cool. Hats off to R.R., Erik and anyone else who was involved in ratcheting this thing up to critical mass, which appears to have been reached. Thanks Twisty. This week was nice as there were 10 separate entries which had votes. Yet, I think the potential for Frost Park Chalk Off and off-shoots events has just started to be tapped. A permanent live and mobile video feeds showing play by play chalking would be nice. Music. Music by Joe I. Bigger prizes. More people. Chalk Off ringer Julian Beaver guest chalk master visit. Attendance by more Tacoma artists who still have not made their appearance and tested their mettle (we are waiting). Wikiepdia entries for Frost Park. Limo and horse carriage rides for chalk off contestants to and from the event. Chalk Off clothing and jewelry line. Lots of possibilities. Plus, we still have not figured out who is the "Best Illustrator in the Universe of Tacoma" for all of 2008, a title of unspeakable prestige. by jamesstoweart on 5/17/2008 @ 11:49am I want to thank everyone that voted for Jen. I am glad she one the prize and getting bragging rights and a title is all I ask for. So I obviously won with the help of what I am now referring to as the "Blogger Bump". No matter what you think of it... it is an immense nebulous force when focused and not to be discounted by any competitor. by Erik on 5/17/2008 @ 12:37pm Yesterday was nice as it seemed like the first Frost Park Chalk Off where the audience seemed to really be watching the competition in the field. In earlier episodes, there seemed like some confusion as what was happening. Thanks Stowe. That will really add to the suspense and challenge. A victory battle art piece of sorts for the winner if I read your post correctly. That will also add to the Frost Park Battle Art genre being developed. Yes, there will also likely be a Corporate Sponsorship for next week. by Elle on 5/17/2008 @ 1:47pm I suppose one could accuse me of Stowe's coined "Blogger Bump" seeing as I post after each competition, but looking at the actual votes only one was from one of my blog readers. And she does happen to be from Washington. If I didn't want the prize so badly I would have voted for Mark. The colors were so vibrant and the red... that red. Gotta find me some of that red chalk. I tried making a metallic gold to follow the unofficial rule of no glitter, but sadly it didn't draw well. by TacomaGnome on 5/17/2008 @ 8:28pm My dear, dear friend Elle would certainly agree, I believe, with what I have to say. And, dear, Erik, it is a grand point to consider. The artist tour and the underground tour, though both open to solely the winner, might be enjoyed by the ecumenical effort put forth by all of our artists. As we gnomes have found there is considerable loneliness in the touring of art by oneself; and I, as a gnome, could hardly imagine the prospects of being underground touring ancient ruins and old place alone. It would be unfitting and just scary to tour the old parts of Tacoma a visit artists alone. Art and history are community events. Not to push the issue, but, perhaps our artists are all deserving of the time with their fellow artisans in Tacoma, as well as a bit of history! That way, we can all be envious or of mutiple people rather than focus our negative energy on just one individual. Generally, the spoils of Frost Park Chalk Offs go exclusively to the victors. Also, the Roland Building is one of the most secure buildings in downtown Tacoma and not on the well worn historical tour network one often reads about. However, I have talked to the sponsor of Episode VI formally known as the Unknown Artist. You may lead the artists who submitted an art entry in Episode VI on a tour of the Roland Building, art studio and other passages by being at 811 Pacific Avenue May 22nd promptly at noon. by jamesstoweart on 5/18/2008 @ 2:47pm I think this is an excellent idea. I am at Frost Park each week to hang with other artists...so I agree completely with the Gnome (how often can you say that outside of a game of DND?). Count me in for the lunchtime May 22nd tour with any and all that can make it (as long as it is over during a average lunch hour). by Elle on 5/18/2008 @ 5:46pm Sadly, May 22nd is a Thursday and market day for the boy and I. It is our special time together and I'm not giving that up for the world. But the generosity of Laura is wonderful. I do need to clarify, and I thank Ms Laura for the opportunity to explore. One concern of mine is security, especially given the coming closed quarters that we will be exploring. Is it possible for me to bring my own security person, so that he may assist me with photography and other related issues we may face? by Erik on 5/20/2008 @ 11:18am Is it possible for me to bring my own security person, so that he may assist me with photography and other related issues we may face? I have done what I can TacomaGnome and taken you as far as possible. Its up to you now for the next step in your adventure. Draw on your other experiences around Tacoma to assist you. All you can do is arrive at noon, look up to the third floor and make your plea seeking entrance. However, I will leave with you an outside drawing of the building which should assist you in locating it and in getting there. Good luck to you TacomaGnome! Ask Embellish Trish to ask Heather (not me Heather. I mean Embellish Heather, the goddess who beautifully manages my hair). by jamesstoweart on 5/20/2008 @ 5:21pm I agree, it really is. by NineInchNachos on 5/20/2008 @ 5:48pm the comic critic comic strip is a great addition to the Cartoonists Northwest Newsletter and I believe the bluemouse theatre newsletter. Nice guy too. by scout on 5/21/2008 @ 4:31pm Hey Gnome - Have you rounded up your security posse yet? If not, today I just bought two new robots for my toy collection. Because they are about your size, work cheap, and now call my building home, it's a no brainer! by TacomaGnome on 5/21/2008 @ 5:11pm I have found the proper detail for my security. I recognize the building, but for safety's sake, can you e-mail the address to tacomagnome@gmail.com.